In 1099 among the vineyards and vegetable gardens that covered the northern part of the city of Rome, close to the Aurelian walls, the first stone of the Church of Santa Maria del Popolo was placed by the Pope Pasquale II. With this act the development of that part of the city was practically started, and in the course of seven hundred years it would have assumed the configuration that we can now grasp in all its complexity. PIAZZA DEL POPOLO was born. The only emerging element was the Augusteo, transformed in 1421 into a fortress for the control of the northern part of the city between the tiber and the hill. The mausoleum was surrounded by poplars the “POPOLUS” to whom the name of the square is to be traced. 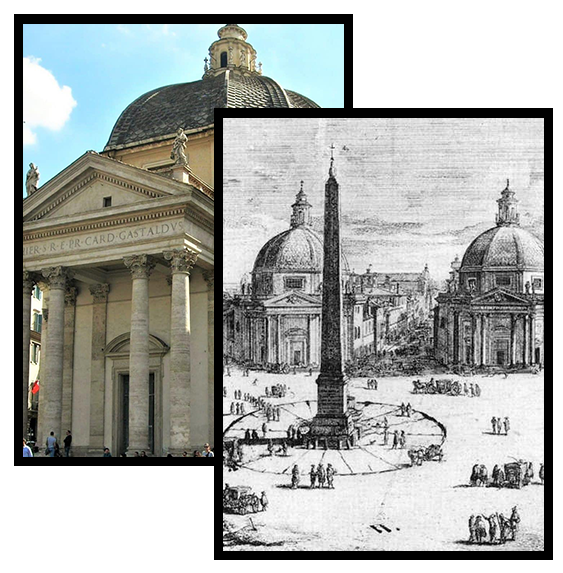 With the passage of time and after the transformation of the Chapel erected by Pasquale II into the church, the term PIAZZA del POPOLO began to be used. The origin of the “PEOPLE” predicate must be traced back to more than you have populations of the Augustinian at the birth of the church. Crossing Piazza del Popolo we enter Via del Babuino (current name) already existing in the fourteenth century and actually had two names: Via dell’Orto di Napoli and Via del Cavalletto. In 1525, thanks to the work done by Pope Clement VII, the street took on a new face and a new name: Via Clementina in honor of its creator became Via Paolina because he put Paul III in 1540. 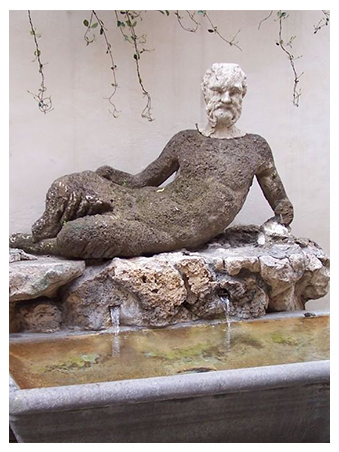 On the interest of Pius V in 1571 a new fountain was installed for the use of the citizens, and for its realization was placed the statue of the “SILENO” classical divinity linked to the springs. The statue became famous to the inhabitants of the district for its ugliness to the point of comparing the figure to a monkey so born “ER BABUINO” which became the name of the street. Continuing the story at the beginning of 1662 the first stone of the Basilica of Santa Maria in Montesanto was blessed by Mons Girolamo Castaldi and on that occasion Pope Alexander VII went to visit the works he had entrusted to Carlo Rinaldi, who after a while died . The works began to stop at the windows of the dome: they were resumed a few years later and completed thanks to the munificence of the Castaldi became Monsignor to the work of Carlo Fontana, Mattia De Rossi under the supervision of Gian Lorenzo Bernini. Over time the basilica of S. Maria in Montesanto became the Church of the Artists. In the adjacent premises of S. Maria in Montesanto there is a small one that since 1921 was inserted a commercial optics business conducted for two generations: March 10, 1967 taking over the exercise is established the Optics of Alexander Spiezia in Via del Babuino al house number 199. Three fundamental rules have been and are the cornerstones of Spiezia optics: correctness, seriousness, and professionalism with these principles, Spiezia has become a reference of fundamental importance. With his availability and professionalism he has welcomed many personalities including Maestro Fellini, Giulietta Masina, Maestro Monicelli and Magni, Pietro Germi, Marcello Mastroianni, and former President Bill Clinton. For years he has participated as an expert on the transmissions of “UNO MATTINA” providing useful news to all those people who have to face corrections with glasses, news on the contactology useful tips how to deal with problems regarding the radiation of sunlight. 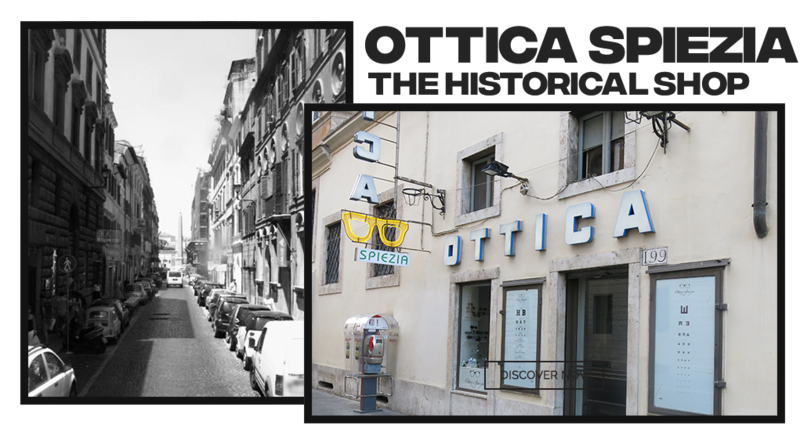 For some years the Optics Spiezia makes use of his son Luca who as a good optician-optometrist reports all the innovations in the field of research.